Reporting to the Provost and Executive Vice President for Academic Affairs, the Global and National Security Policy Institute (GNSPI) brings together global and national security-related courses, research, and programs at the University of New Mexico in a coherent whole under one umbrella to serve the entire institution—students and faculty—across its several campuses. Global and national security rests on a broad definition ranging from nuclear issues to natural resources, humanitarian and health challenges, as well as governance, legal, policy, technology, and cybersecurity concerns. Collaboration among departments, schools, and colleges, and with Sandia and Los Alamos national labs will allow UNM faculty, students, laboratory scientists, and private sector technology and science experts to team-teach graduate modules in specific fields and cooperate on cutting-edge research and innovation projects. The diversity of the UNM student body and faculty brings to the global and national security mix scientific expertise and analytics and cultural and language dimensions and understanding. This expertise will help our future leaders interact more effectively with their counterparts from other cultures and societies. 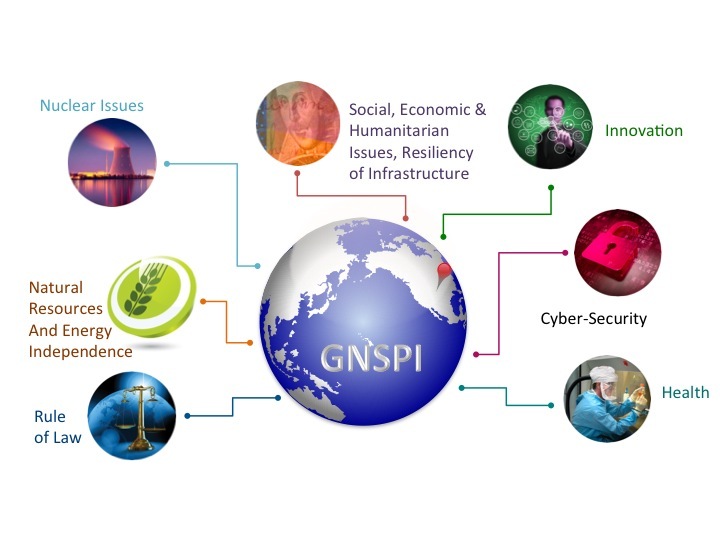 The GNSPI will encourage experts from UNM, the national labs, and the private sector to participate as students and teachers in this uniquely designed learning experience, which would expand their horizons and widen the contexts in which they operate. Additionally, collaboration across these fields will encourage students and researchers to analyze rising threats and challenges to global and national security, and to support national workforce needs in such areas as nuclear security policy, law and governance, health sciences and the combating of global diseases, cybersecurity, and intelligence collection and analysis. This initiative will also help UNM students improve their competitive edge as they compete for jobs and career advancement. The GNSPI will also help put UNM on the global and national maps as a “national security” university.